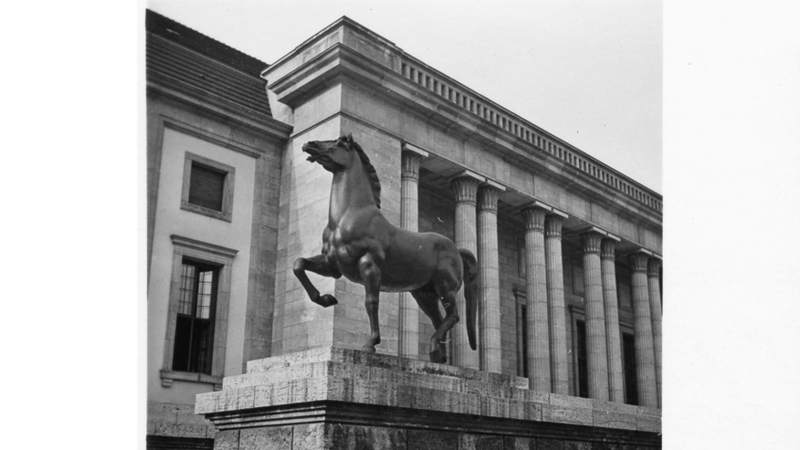 Two life-size bronze horses commissioned to stand outside Adolf Hitler's chancellery disappeared from their last known location in Germany in 1989. Some 25 years later, the masterpieces have been discovered in an illegal art bust, the Local reports. After a year-long investigation, authorities conducting 10 raids across Germany yesterday found the "Walking Horses" by Josef Thorak in a warehouse in Bad Duerkheim, along with other Thorak works and a 33-foot granite relief by Arno Breker, the AP reports. They are now investigating eight people, aged 64 to 79, for art trafficking and handling stolen goods. Triumphant Russian forces reportedly moved the horses in 1945 before they appeared on the sports grounds of a Red Army barracks in Eberswalde of the German Democratic Republic in 1950. They remained there for 38 years until a newspaper article by an art historian turned the spotlight back on the illustrious works. They soon disappeared. The art historian says an acquaintance of a GDP financier recently offered her information about the sculptures, which were rumored to have been sold by the cash-strapped GDR. Police say the works belong to the government as they were commissioned by Hitler's architect, Albert Speer, and therefore by the state, the Wall Street Journal and Washington Post report. The bronze horses lost some of their grandeur over the years as children played on them and their tails were broken and poorly reattached. They were also marred by bullet holes and painted gold at one point. Police haven't described their current condition, but they were reportedly offered on the black market for as much as $5.6 million, per the Post. A police rep says the granite relief found in the warehouse was also to find a home at Hitler's chancellery but was never installed.